The Chinese Dawn Redwood is one of only 3 types of redwoods in the world. The other two being the Coast Redwood and the Giant Sequoia. I had read about them, but never seen one myself. 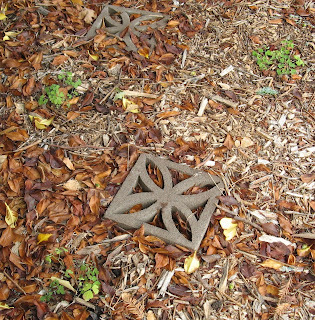 But they've planted one at the UC Davis Arboretum in their redwood grove. All Coast Redwoods, except for this one Dawn Redwood, as far as I could tell. Unfortunately, no Giant Sequoia. The foliage is very similar to the Coast Redwood, but more flexible and softer to the touch. It's also deciduous, so they recommend it for gardens in the Central Valley if you want a redwood, but also some light in the winter. 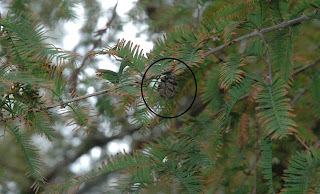 The cones are also very similar to the Coast Redwood. The UC Davis Arboretum consists of 100 acres on the old north channel of Putah Creek. Yes, that is in fact the name of the creek. 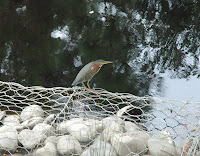 The banks of the creek could use a little restoration work, but the birds don't seem to mind. UC Davis sits in the California Central Valley, which has a Mediterranean climate, but one where temperatures rise and fall much more so than here on the coast. So part of their mission is to experiment with plants and to teach people what they should grow. They even highlighted 100 plants throughout the trails, which do especially well in the Central Valley. With signs they mentioned their ease of maintenance, drought tolerance, etc. They also seem intent to teach people how to grow plants and, especially, how to conserve water. Here's a pic of Evie's silktassle bush (Garrya elliptica 'Evie') from the Native California plant section. And a May night salvia (Salvia x sylvestris 'Mainacht') and a type of scabiosa (?) 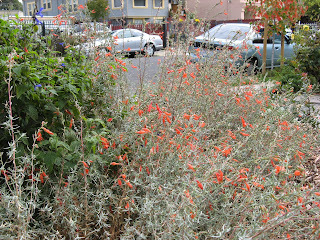 from the drought tolerant garden. All pictures courtesy of Mike. This last weekend I was in Davis with my partner, Mike, who took all the pictures since I forgot my camera at home. UC Davis has a really beautiful campus with some amazing old trees. This one near the old entrance gate to campus especially caught my eye. This "lawn" near one of the pools, the Schaal Aquatic Center I believe, was on small strip of heavily sloped land. I think it's a type of carex. It had the lush greenness of lawn without all the mowing and watering. It sat across from a wide flat space of traditional lawn. So it looked like an experiment to me. I saw rainlilies blooming for the first time last Friday while doing maintenance in a garden in Fremont. Because of the huge storm we had last Tuesday the lilies were blooming. 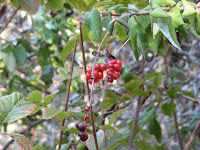 Then, at the UC Davis Arboretum on Sunday, I saw some more. Quite a few actually. They are really beautiful, delicate flowers. I believe in both instances they were Zephyranthes candida. As you can see from the picture the flowers were already on their way out. More on the Arboretum later. As I mentioned in a previous post, right before our torrential downpour last week, I decided to move some plants and get some new ones in the ground. All of them weathered the storm well. Almost 4 inches of rain in a 24-hour period. Highly unusual for us, especially in October. But everything old and new got a nice thorough soaking. First off were 5 (3 in pic) native columbine (Aquilegia formosa) grown from seed from the very prolific plants in my backyard. I planted them under a huge camelia by our front door. There are several other volunteer seedlings awaiting a new home. 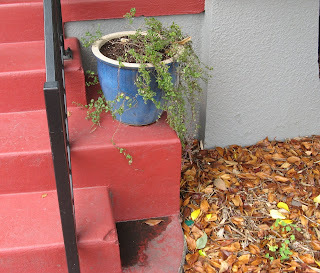 In that same area, I repotted the yerba buena (Satureja douglasii) I had in the back and moved it to the front steps. It's looking a little bedraggled at the moment, but once it fills out I think it will help to distract people from the hideous brick red and dark grey paint of our house's exterior. The yerba buena roots as it crawls, so there were 3 separate rooted plants in back I cut off this main one. I dug up the smallest to repot in a one-gallon to start the whole process again. Also in this pic you can see one of the columbines in the bottom right. Along the path from the drive way to the front steps I planted 3 douglas iris I bought at a plant sale at the Watershed Nursery. I can't wait to see them this spring. And then on to the hellstrip. The mint we threw there to see if anything would survive started to escape from its little concrete strip, so I dug out as much as I could, though I'm sure there will be more to dig out later. Then in went three California fuchsia I saved from a garden I do maintenance on and paprika yarrow divided from the three plants I took out to plant the irises. Unfortunately the reds of the yarrow and CA fuchsia will probably clash, but it's a hellstrip that had nothing but dead weeds a year ago, so I'll take what I can get. 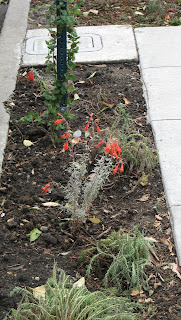 So these pics are not so exciting, it's more the promise of what they'll look like next spring and summer, but here's a pic of the California fuchsia (Epilobium canum) planted in March from the main part of the front yard a few days ago. The torrential downpour we had today had me thinking of how lucky I was to be inside, warm and dry. And how last year in September I was on Mt. Rainier with some friends backpacking in the rain. And Pam over at Digging has a week-long celebration of our wonderful National Parks so I thought I'd add my own post to the list. How's that for a backdrop to your hike. Mt. 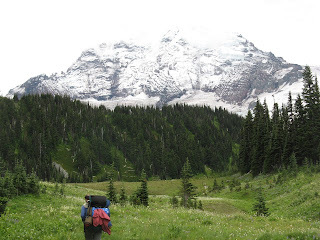 Rainier in Washington is an awesome mountain and park. 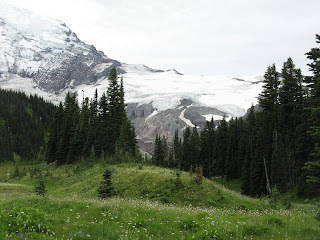 We decided to hike part of the Wonderland Trail which encircles the mountain, a journey of many days. A map of the park is found here. We only had 3. 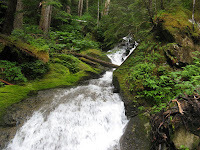 So we started at Mowitch Lake in the northwest of the park and hiked down to Ipsut Creek Camp. A steep drop in 5.5 miles. Then the next day back up (a steep up) to Mystic Lake, some 8 miles. Then the third day the whole way back, retracing most of our steps. On the first day we were racing the setting sun and the 2nd and 3rd days we were racing storm clouds. It was a brutal hike, but well worth it. On the second day, we came into this little vale literally full of wildflowers of all different colors. 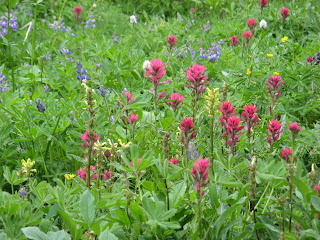 It was good to see two of my favorites, lupine and Indian paintbrush. This paintbrush was an incredibly vibrant pink unlike the more orangish reds I'm familiar with here in California. 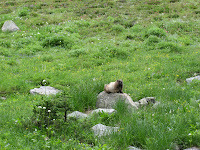 In the sea of wildflowers was this little guy, a marmot, perched on a rock just watching the people walk by on the trail. In the pic below you can see a little more closely one of the best reasons for this park, glaciers. I was lucky enough to walk on Glacier Grey in Patagonia (a Chilean friend of mine was working there leading tours) and was awed by the experience. I remember all different shades of blues, and the sky reflected on the ice. I have never seen a purer blue than when looking into a well of water on the glacier. It saddens me that they are all shrinking and may not be around much longer. I'm always amazed at how much water there is and how green everything is in the Pacific Northwest. Here in the SF Bay Area, we're kind of on the tail end of that climate (similar plants, animals, weather patterns), but it really is just different. You won't find this pic anywhere around here in September. It rained hard the 2nd night and our campsite started to flood. We had to move everything to higher ground and soaked all of our freshly donned dry clothing in the process. Other than that, it was a great trip and we were no worse for wear. Thanks again to Pam and Ken Burns for inspiring her great posts. So it's autumn and I guess I have time to blog. At least my thoughts are turned more that way. 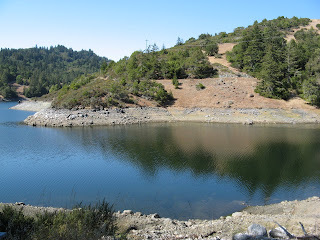 I went for a hike yesterday in Marin past a couple lakes. Bon tempe, Alpine and from a distance Lagunitas. We were supposed to go past lagunitas as well, but my trail notes were not very clear and we went down the wrong way. 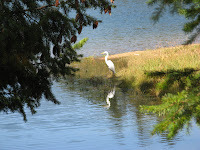 But we saw lots of interesting things including this egret, even saw it catch and swallow a fish. I tried to get a video of that but it all happened too fast. 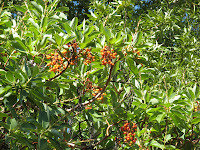 And some madrone berries (orange). Madrones have to be one of my favorite trees. Their beautiful, smooth, cinnamon-colored bark and bright green, shiny foliage make them just pop out of the forest. 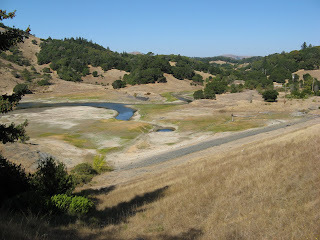 As you can see from the water level of the lake in this first pic above and the second pic of our hills covered in brown, dried grass, here in California we are desperate for some rain. We had an OK, but intermittent winter and a hot summer, and so now my garden is crying out for water. I could claim tough love has prevented me from watering my mixed native and drought-tolerant front yard, but it's mostly been due to laziness and the lack of a spigot out there. Luckily for my plants, and my guilt complex, a serious storm has been forecast for Monday night/Tuesday. So Friday and today were a mad dash to get some winter crops in the back and to move and plant a bunch of things in the front. More on that in my next blog post I think. Yet another reason I haven't been blogging, winetasting. I spent last weekend with my partner's family in Napa with a vineyard behind us and some really cool rock formations at the end of the road. I don't usually like winetasting in Napa for a couple of reasons. Most wineries charge a ridiculous amount for tastings and I'm often ignored because I'm young and don't look like I have lots of money to spend on cases of wine, which I don't. I've found Sonoma a much friendlier experience. But I had a really good time, and tasted some great wines, at the first place we went to - the Robinson Family Vineyards. Located off the Silverado Trail, the vineyard has a nice backdrop of the rocky crags at the edge of the Napa valley. But more importantly it is an actual small, family-run vineyard. The woman who gave us the tour is one of three sisters whose grandparents started the vineyard. The grandparents have passed away, but we saw three generations working their that day. The woman's father, son-in-law to the founders, is the winemaker and was also giving a tour to another group. And then the woman's two young children were in a vat stomping on grapes. Very messy and cute. She assured us that that is not how they generally press the grapes, but I have to say they looked like pros. All of the wines were good, but my favorite was the 2005 Great Legs Syrah. In fact, it was my favorite for the day of all 3 wineries we visited. The $10 tasting fee was affordable, unlike the $25 at the other two wineries, and included a tour and a lot of family history about the place. I believe you need reservations to taste there, but it was well worth it.